Tokyo, Japan -- The pilgrimage experience is not singular. It can be a journey of enlightenment, a chance to improve your health or to expiate for a wrong deed. And there’s also the more mundane business of administering to blisters. 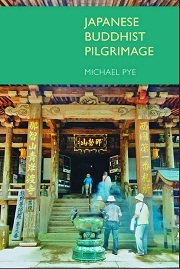 << Japanese Buddhist Pilgrimage, by Michael Pye 267 pages, Equinox Publishing, Nonfiction. The experience will also depend on the length and duration of the exercise, the nature of the terrain and the physical and mental stamina of the participant. In Japan, as Michael Pye writes in his engaging study “Japanese Buddhist Pilgrimage” pilgrimages have been turned into considerably less arduous ordeals than they were in the past thanks to public transport, comfortable lodgings, good food and an ample supply of vending machines. Truncated versions, like the popular circuit of temples and shrines associated with the “Seven Lucky Gods of Fortune,” can be accomplished in just one day. This is a little like the condensing of famous sights in China and Japan with miniatures in the stroll gardens of the Edo Period (1603 to 1868), or the practice of building small Mount Fujis that could be climbed by women, the infirm or penurious. In an age when travel permits were hard to come by, pilgrimages were sometimes ruses for those who could not obtain the necessary papers to make excursions for pleasure. Pye, who came to Japan in 1961 and has subsequently tested countless routes first hand, focuses primarily on the country’s traditional “circulatory pilgrimages,” typically involving a sequence of 33 or 88 sites. The completion of these perambulations, we learn, may be serious affairs, but are rarely somber undertakings.